The Main chamber is located to the left of the console. 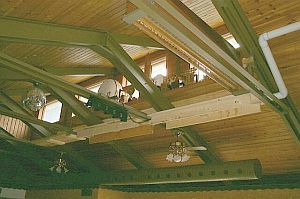 Both the Main and Solo chambers are constructed of two levels of pipe work. The photo to the right shows the lower level in the Main chamber with the rare Kimball Cobra-head English Horn (Cor Anglais) the Orchestral Oboe, and Concert Flute and Concert Flute Celeste. Not yet installed when this photo was taken is the Kimball French Horn. These photos are of the lower level of the Solo chamber. 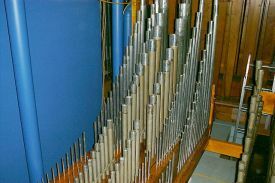 To the left is the Gamba, Horn Diapason, and Gamba Celeste (l to r). To the right is the Wurlitzer Solo Vox Humana, Wurlitzer Brass Trumpet, an Morton Solo Tibia Clausa (l to r). The upper level of the Solo Chamber includes the Post Horn at the rear, the Spitz Flute and Celeste, Oboe Horn, and Kinura. Fred Gollnick snaps a rank driver board to its mountings after installing the chest in the Solo Chamber. 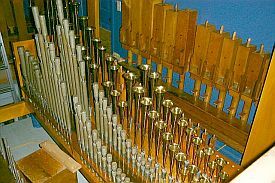 Unique to theatre organ building was the Robert Morton practice of making single rank chests for their pipes. All Robert Morton chests were designed to hold only a single set of pipes. This made it very easy for them to layout a chamber, as all they did was to place the proper chests for the ranks allocated to a given chamber side by side. 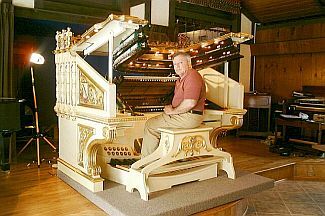 Other builders such as Wurlitzer, Kimball, and Moller built custom chests for each installation with each chest accommodating multiple sets of pipes. The Morton design makes servicing easier as the troublesome chest can be easily removed for servicing once the pipes have been removed. Morton chests were designed for 61 or 73 notes on several pipe spacing layouts. With no real way to provide the classical console lift in the installation, Paul chose instead to go with a moving platform arrangement similar to the manner in which the Radio City Music Hall consoles are implemented. Fred Gollnick designed a tubular steel framework to hold the console. Embedded within the framework are four axles of rubber-coated rollers that act as wheels. 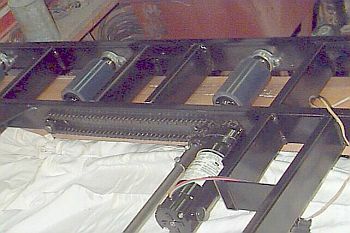 They are interconnected with a chain drive. A DC motor powers the platform in and out of its portico. The frame is covered with 3/4" plywood and then industrial carpeting. A panel under the pedalboard allows access to the drive motor. A pair of limit switches on the platform interrupts motor power should there be a control failure. The gearing is such that the console platform can be pushed by hand if absolutely necessary. A programmable logic controller (PLC) controls the platform movement. In addition to handling the sequenced start-up and shut-down of the organ console, blower and chamber power, and audio systems, the PLC controls the movement of the lift based on its position and which button (Out, Picture, In, Stop) has been selected. As there could not be any limit switches or sensors in the stage floor due to its use for non-organ programs, Bob Wilhelm's solution was to sense the platform position using the taught console signal and power cable. As the cable must be kept taught so as not to get bound up as the platform moves, Fred designed the cable counterweight system to maintain a constant tension of the console cable as the platform moved. Bob installed positional limit switches based on the counterweight pulley's position to tell when the platform was at either end of its travel and at an intermediate position. To the left is the console shell fully assembled before refinishing. When Paul acquired the console it had been heavily modified. Much of the decorative ormolu was broken or beyond sensible repair. Dave Krall made molds from the old console decorations and recast new ones. Those were then hand finished and sanded and applied to the console. 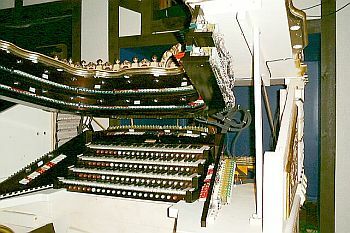 Morton consoles normally had their combination action setters in drawers sliding out of either side of the console faceplates. 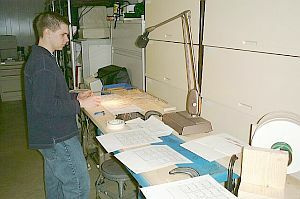 In a change to accommodate additional tables Paul had the boxes moved below the key desk as seen in this photo. Combination action controls were placed in the lower left drawer with blower and moving platform controls in the lower right drawer. 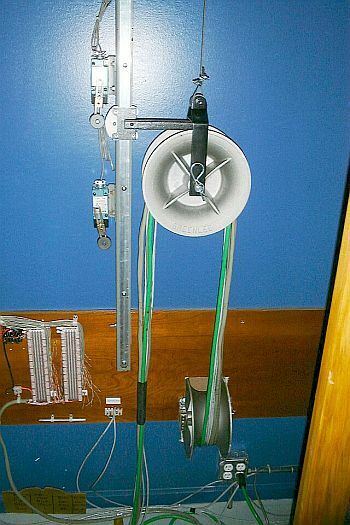 This photo was taken when the console was fully assembled in the basement of Dave Krall's home. Dave Krall is seated at the console adjusting the Great Manual's second touch contacts. Just as Morton had done, the top cover of the horseshoe hinges up to allow access to the two full rows of stop tablets. The four keyboards do not slide out as with many consoles but only hinge up for access to the contacts, key spring adjustments, and combination action piston wiring. The dimmable low-voltage lighting that surrounds the top cover were added to highlight the ornate decorations of the console shell. 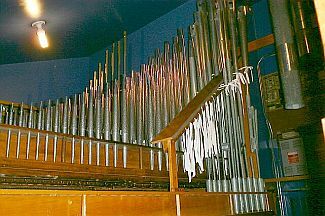 The small rows of lights within the console horseshoe are actually 1/2" copper pipe caps mounted to a copper plate and then chrome plated courtesy of Bunn=Minnick Pipe Organs of Columbus, Ohio caretakers of the famed Ohio Theatre Robert Morton. All the light sockets are Harley-Davidson! 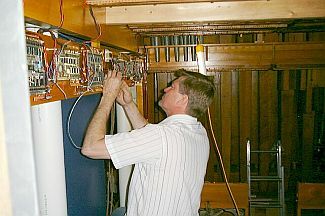 While the general trend today is to replace theatre pipe organ electromechanical relays with computer based systems such as Uniflex, Paul elected to stay with the system he had since rewiring of the chamber chestwork would not be required. This decision still necessitated the custom fabrication of many wire harnesses. The most complex was the main cardcage harness shown being assembled in the left to photographs. An error here and there's no telling what the outcome might be. 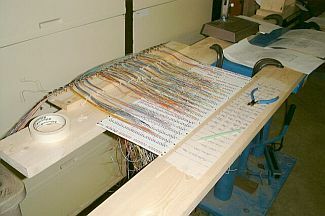 Also required is an extensive array of wire harnesses for connecting the tablets, keyboards, and numerous buttons and levers to the relay system. 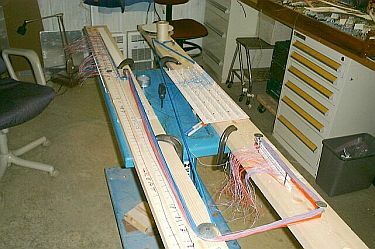 The right lower photograph shows one of the harnesses being fabricated in Bob Wilhelm's lab. 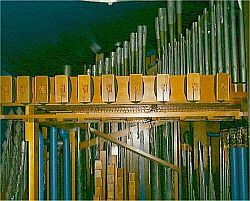 Shown to the right are the 16' Gamba pipes. 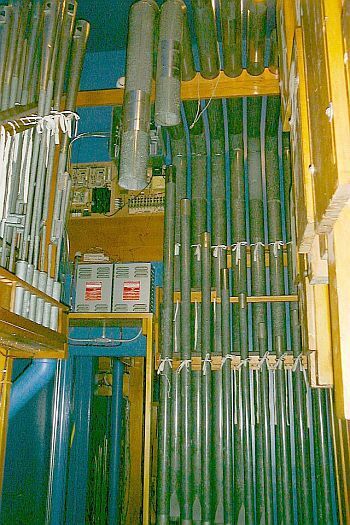 Above the door between the two chambers is mounted the two rectifiers, Peterson 32' Flute and 8' String Bass generators, and the PLC controls for the instrument. High above the seating area are the untuned percussions and sound effects. Directly over the organist's head is the Xylophone. With every installation there comes a time to see what the fruits of labor have brought forth. Unfortunately neither Paul nor Linda can play the theatre organ. While many technicians can play to some extent, none of those associated with this project played as well. Hence an partially installed instrument and no way to find out how well it functioned. 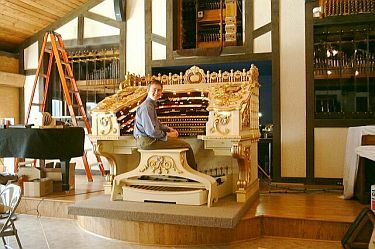 While there are organists available near Wheaton, most have full time jobs and are not available for extended periods of time. Fortunately Richard Hills had some time available in his schedule between semesters and was able to visit for a lengthy stay to start running the instrument through its paces. 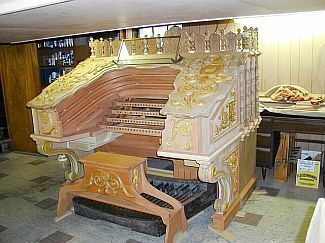 While the organ wasn't complete as the photo details, none the less all were impressed by the initial sounds the instrument produced. 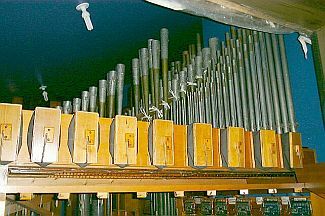 This photo was taken in late July 2001 and it would not be until the end of the year that the instrument would first be heard in public performance. Photos by: Robert E. Wilhelm, Jr.